For police, fire, and other emergency personnel, reliable two-way radio communication is critical to mission success. Zetek's Wireless Repeater technology eliminates the problems that have plagued communications within both large and complex structures by using Zetek's patented technology to radically extend the physical range of signal propagation within buildings. The Wireless Repeater System consists of a number of Wireless Signal Repeaters installed throughout the building or structure. No wiring is required, and each unit is powered entirely by a battery with a lifespan of over two years. Zetek's long distance signal propagation technology permits communication between any two repeaters without relying on daisy chains of devices, ensuring that coverage can be maintained even if only a limited number of repeaters are operational–regardless of the size, shape, or materials of construction of the structure. All repeater units are capable of converting an analog signal into a digital signal, and vice versa, and passing the digital signal on to every other unit. In addition to increasing reliability, this setup greatly extends the range of radio communications. The Wireless Repeater System also has the ability to check itself for good working order. Even when the system is not in use, it is self-polling, and periodically sends out signals to the Wireless Signal Repeaters and receives responses from them in order to monitor their operability, battery output level, and other key criteria. 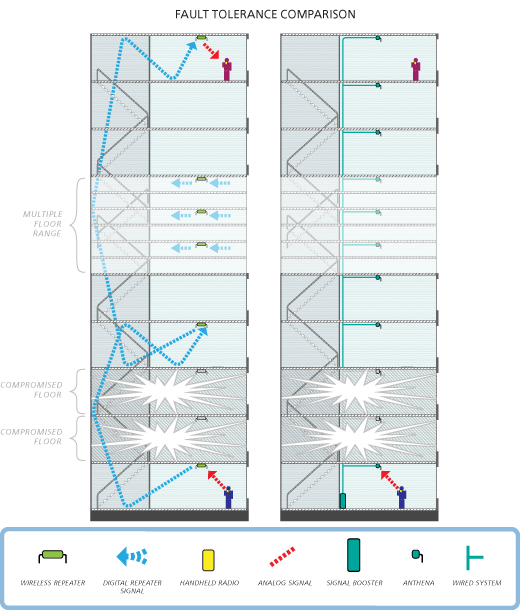 With Zetek's patented technology for long distance indoor signal propagation, a small number of Wireless Signal Repeaters placed throughout a building can create a digital network supporting two-way communications between any two points within even the largest, most complex facilities, eliminating dead spots, signal attenuation, and overcoming structural interference. Zetek's truly Wireless Repeater System helps ensure communication between any two points in a structure even if electrical power is lost or parts of the network are damaged. Each Wireless Repeater is a completely independent battery-powered unit. Zetek's system checks each repeater periodically for operability, battery output, and other key criteria. Batteries or even inoperable units are easily replaced by building maintenance crews. Zetek's patented technology for long range indoor signal propagation along with advanced power management allows Zetek's Wireless Repeater System to boost transmissions from any unit, creating a wireless digital network that can maintain full connectivity even if an emergency has destroyed some of the Wireless Repeaters. Other systems require extensive cabling with multiple antennae and depend on additional building wiring for their power, making their signal coverage vulnerable to outages and compromised cables. Maintains critical communications links in complex structures and over long distances during emergency operations. Ensures communication between teams and command station. Helps Internal Security teams coordinate responses to incidents and communicate from incident locations. Ensures communication for police and other emergency responders. Aids in policing and security operations at military bases. 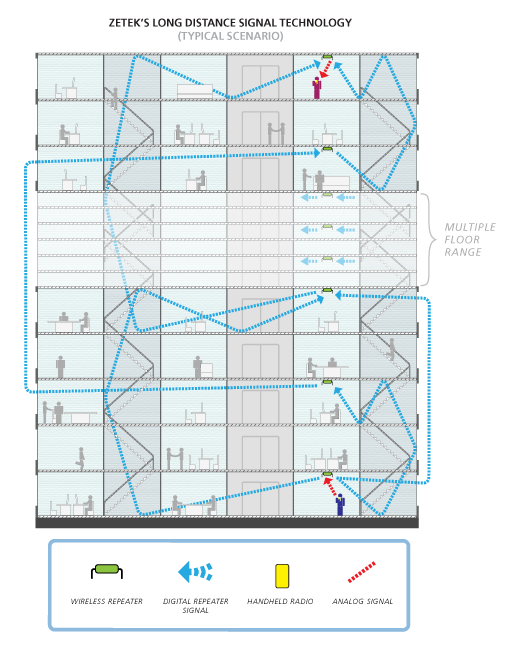 Allows internal and external emergency response teams to communicate even in severely compromised structures, helping support fast, safe evacuation of building personnel and visitors. Maintenance: Helps internal and external maintenance teams communicate with each other and managers so that facility operations can be maintained with minimal service interruptions. Event Coordination: Allows building personnel to communicate easily with vendors, ensuring that conventions and other large-scale events run smoothly. Manufacturing and Warehousing Resource Management: Allows for wireless communication between different areas of complex structures, increasing the capability of plants and workers. No Installation Wiring Required No wiring required. Each repeater is powered exclusively by a disposable battery with a two-plus year lifespan making the system easy and inexpensive to install and maintain. Long Distance Signal Propagation Creates fully connected network that eliminates dead spots, weak signals, and interference. Power Management Advanced power management combined with long distance indoor coverage allows repeaters to boost signal and bypass damaged units. Self-Diagnostic System checks each repeater periodically for operability, battery output, and other key criteria. Zetek's Wireless Repeater System is not only more reliable than other approaches to indoor wireless signal range extension, but also far more cost effective. 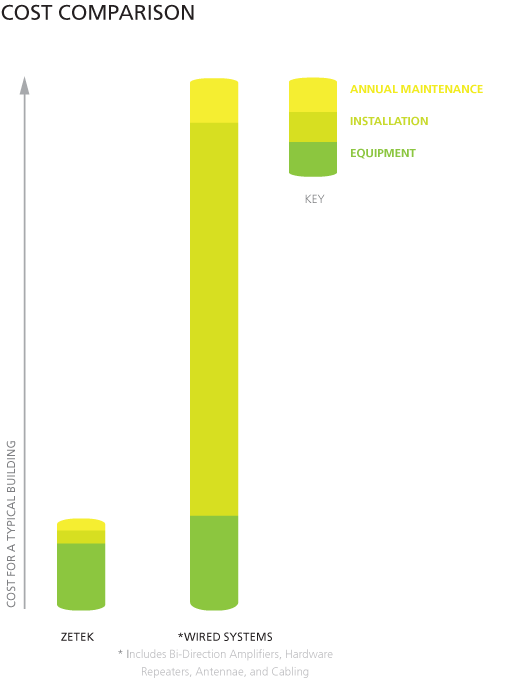 Our patented technology for long range indoor signal propagation means that our system operates with a small number of units, keeping costs for equipment, installation, and annual maintenance lower than for systems with comparable signal coverage. Unlike other approaches, all of which require expensive wiring, Zetek's Repeater Units are truly wireless and can be fastened to the wall in a simple, non-disruptive installation by personnel with no special training. No additional maintenance is required other than simply replacing the battery of each unit every two or more years. Zetek's Wireless Repeater System polls each repeater periodically for operability, battery output, and other key criteria. If a unit is inoperable it can simply be pulled off the wall and replaced all by regular facility maintenance crews.